People are always rushing to get somewhere as fast as possible. But it's normal around holiday time I guess. Everbody suddenly feels important and wants to exchange wishes, and thoughts. Wanting to get all things done in the shortest time possible. Who can blame them? One of the greatest things to do around this time of year (you know, besides the actual preparations) is a general breakdown. Going back through the months and seeing how things evolved. It's amazing how time molds things. I'm thinking of doing a summary in photos. I will get down to it as soon things cool down a bit. Until then, Vanity Fair has already done this. Divided in two parts (1, 2) works of artistic photos for your delight. 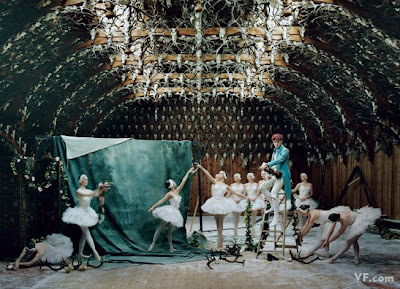 My favourite must be this photo of Patrick Wolf surrounded by the cygnets of the Ballet West in Braemar, Scotland. Patrick will surely remain one of my biggest music crushes ever. Sigh. Photograph by Tim Walker; styled by Sarajane Hoare. And of course, this is what happens when two brilliant minds work together. Karl Lagerfeld and Zaha Hadid inside their Chanel Mobile Art exhibit. Photograph by Todd Eberle. A photo which tops them all by far. Can you take it? American fashion’s new guard. Top (from left to right): Brian Reyes, Peter Som, Sari Gueron, Chris Benz, Erin Fetherston, Richard Chai, Phillip Lim, Laura Mulleavy (Rodarte). Middle: Doo-Ri Chung, Georgina Chapman (Marchesa), Zac Posen, Kate Mulleavy (Rodarte). Bottom: Alexander Wang, Lisa Mayock and Sophie Buhai (Vena Cava), Thakoon Panichgul. Photograph by Jenny Gage and Tom Betterton. Be sure you get to see all the other V.F. photos, they are mind-blowing perfect and featuring celebrities in some intriguing poses, getting closer to real works of art. absolutely love BRIAN REYES!! He's amazing!